As well as excellent skiing, it is the Apres-ski that Austria ski holidays are most notable for, with restaurants packed with people well before the end of the day, and many bars accommodating fun loving skiers from midafternoon until the early hours. If this is your cup of tea then why not rent yourself one of our ski chalets in Solden, or perhaps head for the Saalbach or St Anton ski resorts. However nightlife is not just limited to drinking and dancing. There are lots of floodlit toboggan runs, Tyrolean bowling, fondue nights and karaoke evenings. Whilst there are a few exceptions such as Obergurgl, Ischgl and Lech, Austria is not particularly regarded for its reliably good snow cover, due to many of its ski resorts being at low altitude. That said most low resorts have significantly increased their snow making capacity in recent years to compensate. Austria has thousands of family run guesthouses, and as a result catered chalets or self catering apartments are in general less widely available. Let Simply Alpine Chalets assist you in finding your perfect ski holiday accommodation. We currently offer ski chalets in 90 Austrian alpine resorts. With so many great resorts to go snowboarding or skiing in Austria, such as Gerlos, Fugen or Zell am See, we are confident you will find the chalet or apartment that meets your holiday requirement and will not be disappointed. Whether you choose one of our Mayrhofen ski chalets for your next skiing holiday or perhaps one of our Seefeld chalets for a summer lakes and mountains or alpine activity break, you can be confident that you will have an enjoyable holiday to remember. So whatever you choose to do we will have a choice of perfect ski chalets in Austria waiting for you. Chalet 830 INC FLIGHTS is located in the Austrian ski resort of Mayrhofen. This ski chalet has 15 bedrooms and can accommodate upto 43 people on a Half board basis. Schwalbenhof is located in the Austrian resort of Wildschonau. This chalet has 12 bedrooms and can accommodate upto 40 people on a Room only basis. Conveniently located near to the pistes of the Austrian resort of Mayrhofen. Haus Mariandl has 16 bedrooms and can accommodate upto 36 people on a Room only basis. Tirolerhof offers comfortable holiday rental accommodation in Umhausen-Otztal on a Room only basis. Tirolerhof is a 3 bedroom apartment that can comfortably accommodate 8 people. A 4-bedroom apartment which can sleep 16, situated in the resort of Zell am See in Austria. Available for holiday rent on a Room only basis. This 8 bedroom chalet is located in the Austrian resort of Mayrhofen. Available on a Room only basis, Borleitenhof can sleep upto 21 people. Fiechter is a 3 bedroom apartment that can comfortably accommodate 10 people. Conveniently located near to the pistes of the Austrian resort of Fugen it is available on a Room only basis. A 8-bedroom chalet which can sleep 18, situated in the resort of Mayrhofen in Austria. Available for holiday rent on a Room only basis. Offering holiday accommodation in Nationalpark Hohe Tauern on a Room only basis, Bauernhaus Grublhof is a 10 bedroom chalet that can comfortably accommodate 26 people. The property also features a Sauna and Wifi. Hochwart offers comfortable holiday rental accommodation in Mayrhofen on a Room only basis. Hochwart is a 3 bedroom apartment that can comfortably accommodate 8 people. This 2 bedroom apartment is located in the Austrian resort of Montafon. Available on a Room only basis, Haus Brandl can sleep upto 6 people. A 3-bedroom apartment which can sleep 6, situated in the resort of Wildschonau in Austria. Available for holiday rent on a Room only basis. Conveniently located near to the pistes of the Austrian resort of Wildschonau. Fichtenblick has 2 bedrooms and can accommodate upto 6 people on a Room only basis. This 12 bedroom chalet is located in the Austrian resort of Langenfeld. Available on a Room only basis, Haus Marina can sleep upto 28 people. Conveniently located near to the pistes of the Austrian resort of Mayrhofen. Haus Muhlfeld has 3 bedrooms and can accommodate upto 7 people on a Room only basis. Therme offers comfortable holiday rental accommodation in Bad Kleinkirchheim on a Room only basis. Therme is a 1 bedroom summer alpine apartment that can comfortably accommodate 4 people. Conveniently located near to the pistes of the Austrian resort of Mayrhofen. Rieplerhof has 6 bedrooms and can accommodate upto 14 people on a Room only basis. Unterkofler is a 1 bedroom chalet that can comfortably accommodate 4 people. Conveniently located near to the pistes of the Austrian resort of Lavanttal it is available on a Room only basis. Winnebachhof is a 3 bedroom apartment that can comfortably accommodate 6 people. Conveniently located near to the pistes of the Austrian resort of Langenfeld it is available on a Room only basis. Bauernhof Maiklerhof offers comfortable holiday rental accommodation in Mayrhofen on a Room only basis. Bauernhof Maiklerhof is a 3 bedroom apartment that can comfortably accommodate 7 people. Haus Margit is a 1 bedroom chalet that can comfortably accommodate 5 people. Conveniently located near to the pistes of the Austrian resort of Mayrhofen it is available on a Room only basis. Haus Eberharter is located in the Austrian resort of Mayrhofen. This apartment has 1 bedroom and can accommodate upto 5 people on a Room only basis. Conveniently located near to the pistes of the Austrian alpine resort of Serfaus-Fiss-Ladis. Haus Leo has 3 bedrooms and can accommodate upto 8 people on a Room only basis. Offering holiday accommodation in Umhausen-Otztal on a Room only basis, Appartment Rieser is a 2 bedroom apartment that can comfortably accommodate 6 people. This 5 bedroom apartment is located in the Austrian resort of Fugen. Available on a Self catering basis, Stiplerhof can sleep upto 12 people. This apartment also features a Fireplace, TV and Wifi. This 2 bedroom apartment is located in the Austrian resort of Mayrhofen. Available on a Room only basis, Haus Unterbrunner can sleep upto 7 people. Hanser is located in the Austrian resort of Mayrhofen. This chalet has 7 bedrooms and can accommodate upto 22 people on a Room only basis. Christof offers comfortable holiday rental accommodation in Wildschonau on a Room only basis. Christof is a 2 bedroom apartment that can comfortably accommodate 6 people. Haus Edelweiss is a 5 bedroom apartment that can comfortably accommodate 12 people. Conveniently located near to the pistes of the Austrian resort of Mayrhofen it is available on a Room only basis. Harringer is located in the Austrian resort of Wildschonau. This apartment has 1 bedroom and can accommodate upto 5 people on a Room only basis. This 5 bedroom chalet is located in the Austrian resort of Werfenweng. Available on a Room only basis, Bauernhof Glatzbichl can sleep upto 11 people. Conveniently located near to the pistes of the Austrian resort of Montafon. Haus Lerch has 2 bedrooms and can accommodate upto 5 people on a Room only basis. This apartment also features a Sauna and Wifi. Located in the Austrian alpine resort of Bad Kleinkirchheim. Schwarzwald has 3 bedrooms and can accommodate upto 8 people on a Room only basis. This summer alpine apartment also features a TV and Wifi. Oblasser offers comfortable holiday rental accommodation in Mayrhofen on a Room only basis. Oblasser is a 8 bedroom chalet that can comfortably accommodate 19 people. 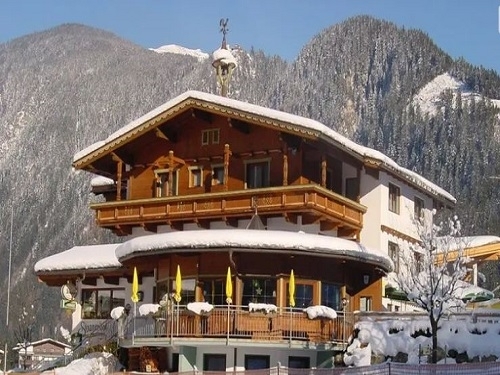 A 5-bedroom apartment which can sleep 10, situated in the resort of Mayrhofen in Austria. Available for holiday rent on a Room only basis. Featuring a Sauna, Fireplace, TV and Wifi, Berggrubenhof offers comfortable holiday rental accommodation in Fugen on a Self catering basis. Berggrubenhof is a 6 bedroom chalet that can comfortably accommodate 13 people. Located in the Austrian resort of St Anton. Jagdhaus Strengen has 4 bedrooms and can accommodate upto 9 people on a Room only basis. Conveniently located near to the pistes of the Austrian resort of Mayrhofen. Ferienwohnungen Schusterhausl has 5 bedrooms and can accommodate upto 12 people on a Room only basis. Haus Mathoy is located in the Austrian resort of Langenfeld. This apartment has 4 bedrooms and can accommodate upto 8 people on a Room only basis. This 11 bedroom chalet is located in the Austrian resort of Pitztal-St Leonhard. Available on a Room only basis, Haus Bergkristall can sleep upto 29 people. This chalet also features a Sauna and Wifi. Jenewein offers comfortable holiday rental accommodation in Wildschonau on a Room only basis. Jenewein is a 2 bedroom apartment that can comfortably accommodate 6 people. A 2-bedroom apartment which can sleep 6, situated in the resort of Zell am See in Austria. Available for holiday rent on a Room only basis. A 1-bedroom apartment which can sleep 4, situated in the resort of Solden in Austria. Available for holiday rent on a Room only basis. Haus Mittagspitze offers comfortable holiday rental accommodation in Montafon on a Room only basis. Haus Mittagspitze is a 11 bedroom chalet that can comfortably accommodate 28 people. Conveniently located near to the pistes of the Austrian alpine resort of Serfaus-Fiss-Ladis. Haus Apart Grazia has 3 bedrooms and can accommodate upto 7 people on a Room only basis. Offering holiday accommodation in Mayrhofen on a Room only basis, Haus Oberhaus is a 8 bedroom chalet that can comfortably accommodate 18 people. Offering holiday accommodation in Werfenweng on a Self catering basis, Edelweiss is a 2 bedroom apartment that can comfortably accommodate 6 people. The property also features a Sauna and TV. Garbelas Hof is located in the Austrian resort of Langenfeld. This apartment has 10 bedrooms and can accommodate upto 26 people on a Room only basis.